Today, I want to do a book review of the book “Go Pro: 7 Steps to Becoming a Network Marketing Professional” by Eric Worre. I recently purchased this book on Amazon at the suggestion of one of my business mentors. I have to tell you that I thoroughly enjoyed the book. What I want to do in the paragraphs below is give you a book review and share what I learned and tell you WHY you should purchase and read the book. Enjoy! About the Author: I think it’s best to start out by telling you a little bit about Eric Worre. This guy is quite perhaps the best trainer in the network marketing industry. He is the creator of Network Marketing Pro, quite perhaps the most popular network marketing training website online. He is a respected trainer, coach, speaker, consultant, and adviser to many different MLM Companies. He’s earned millions in the industry and has even owned his own MLM Company. The bottom line is that Eric Worre is the real deal and he is qualified to teach about our industry. Of all the people in the industry, this guy GIVES BACK and does more to help our profession than anyone else that I know of. As a result, I have the utmost respect for Mr. Worre. Details of the Book: The book was published in 2013 by Network Marketing Pro. It features 12 chapters and 149 pages. You can purchase it in the softcover or Kindle version. The 13 digit ISBN is 978-0-9886679-0-7. You can buy the book anywhere books are sold. Order a copy on Amazon. What it Covers: The book covers just about every part of building a successful MLM Business imaginable. It is broken down into 12 chapters. Here are the names of each chapter so you can see what information is covered. What I want to do in this section is share some of my favorite quotes from Eric Worre in his book “Go Pro: 7 Steps to Becoming a Network Marketing Professional.” These are quotes that just resonated with me. Each quote is in bold and italics. I will also share my thoughts on each quote. # 1 The moment a person decided to be an achiever they become a target. My Take: Any time you step out of your comfort zone and do something different, those closest to you will be scared and uncomfortable. As a result, many of these folks will label you as a target and attack what you are doing, to justify their existence. # 2 In the future you’re only going to be paid for performance. My Take: The economy is changing. The days of high salaries and job security are pretty much over. In today’s world, you get paid to show up. In the future, you will see more commission and performance based jobs that pay people to produce, not just show up. This is great news for achievers and bad news for slackers. # 3 It’s better to be excited and ignorant than it is to be apathetic and smart. My Take: You need to be enthusiastic about what you do. It helps to be smart and trained properly too, but enthusiasm wins out every time. Ignorance on fire is better than knowledge on ice. # 4 If you’re involved in this great profession, decide to do it right and treat it like a profession. My Take: Treat your network marketing business like you have a million dollars invested in it. Be a network marketing professional. Act like a professional. Dress like a professional. Educate yourself about your company, network marketing and entrepreneurship. Make it a career, not a hobby. # 5 You need to take full responsibility for your network marketing business. Decide today never to blame anyone or anything else for your lack of results. My Take: We live in the victim society. However, there is no such thing as a successful victim. If you want to succeed in this business, you have to “man up” and accept 100% responsibility for your actions, success, and/or failure. # 6 I realized why the pros had such great results. Instead of acting like sharks, they were more like coaches or consultants. They built relationships and then offered common-sense solutions to people’s problems. My Take: Become the hunted, not the hunter. Focus on educating and helping people rather than trying to pitch and sell people. Get good at asking questions and then be a good listener. Find a need and then offer a solution to meet that need. # 7 You must emotionally detach yourself from the outcome. My Take: You cannot be an emotional roller coaster. You need to balance your emotions. Don’t let people’s decision to join, or not join your team, affect how you feel emotionally. Be constant. Expect nothing from everyone, so you can be grateful when people do join or do something to build their business. # 8 When you value what you have people will respect you. My Take: If you respect yourself and your business opportunity, others will respect you. If you don’t think highly about what you do, others won’t think highly of it either. If you haven’t sold yourself on what you are doing you won’t be able to sell anyone else on the idea. # 9 In network marketing it doesn’t matter what works. It only matters what duplicates. My Take: Keep things simple so even a caveman can do it. If the newest person can’t do what you are doing, you aren’t doing things right. # 10 When you are prospecting, you are the messenger – not the message. Get yourself out of the way and use a third-party tool. My Take: The purpose of meeting someone or talking to someone is to set an appointment and give them a third party tool, not show a presentation on the spot. What you are offering is the solution. You are not the solution. You are not the message. You are the messenger. # 11 People respect a person who does what they say they are going to do. My Take: Say what you do and do what you say. If you say you are going to call someone in 48 hours, then do it. If you say you have an appointment at 10:00, be there on time. Be a person of integrity. Once you lose your integrity it’s hard to get it back. # 12 You never finish one exposure without setting up the next one. Never! If you do, it’s over. My Take: Always move your prospect through the sponsoring process. You don’t just show one presentation and hope they will sign up. You have to have a systematic way of following up and always giving your prospect more information, to include webinars, audio CDs, three-way calls, product samples, events, etc. The purpose of a meeting is to book another meeting. # 13 It takes an average of four to six exposures for the average person to join. My Take: Most people need to see and hear a message repeatedly before they do anything about it. In the traditional selling world, it can take 20 or more “contacts” before someone purchases your product or service. Keep your message in front of your prospects as much as possible. The more follow ups and exposures the better. # 14 New distributors crave direction and they respond incredibly well to simple assignments. My Take: When someone joins your team, they are like a newborn child. You need to give them purpose, direction and TONS of attention. Give them small assignments, follow up with them daily, and help them get started right. Do that right and eventually they will become independent of you. # 15 Meeting people one on one, in small groups, or at local or big events, will have a huge impact on the long-term success of any network marketing organization. My Take: People love herds. Create a herd of your own or plug your people into your upline’s herd. When people hang around other people with similar interests, they get excited and have a sense of belonging. Never underestimate the power of face to face interaction, especially in today’s world where that doesn’t happen very often. # 16 If a person starts a traditional business, they expect to break even in their first few years and possibly pay back the initial investment in the first five years. But when a person starts a network marketing business, they expect to get their money back in the first month, make a profit in the second month, and get rich by the third month. And when that doesn’t happen, they blame network marketing! My Take: It amazes me how many wimpy and pathetic people come into our industry. All businesses take time to build. Network marketing is no different. You must have vision and you must do the work BEFORE you see the results. This is not the lottery. # 17 It will take you about one year to become competent and profitable in network marketing. You’ll know the basics, you’ll cover expenses, and you’ll be learning. It will take about three years of consistent part-time effort in order to go full-time. It will take about five years of consistent effort to become a six figure earner or above. And it will take about seven years of consistent effort to become an expert. My Take: Good things take time. This is some of the best advice in his book. You won’t get rich overnight, but within a few years you can increase your knowledge, expertise and income. # 18 Try to avoid reinventing the wheel when you get involved in the profession. My Take: Follow the system your upline has. Franchises are so successful because they have systems that anyone can follow. They minimize the human element for making mistakes. You want something that anyone on your team can do. # 19 You should be focused on a very narrow range of skills: Finding prospects, inviting, presenting, following up, closing, getting people started right and promoting events. My Take: These are the skills that make you money in network marketing. Spend 90% of your working hours on these skills and you can’t go wrong. Don’t confuse being busy with being productive. # 20 Almost all of the learning in MLM is in the doing. My Take: You can buy courses, attend seminars and read books until the cows come home, but it’s APPLIED knowledge that matters most. Applying what you learn is more important than what you learn. At some point you have to roll up your sleeves and do the work. # 21 Part of the reason people avoid taking action is they are afraid they’ll be embarrassed. My Take: Don’t worry about failing or making mistakes. Everyone goes through that. The truth is, most people aren’t thinking about you anyway. Instead, they’re thinking about themselves. The more you mess up and fail, the more money you will make! You can’t succeed your way to success. You have to fail your way to success. # 22 You’ll become the average of the five people you spend the most time with. My Take: The power of association is huge. Be careful who you spend time with because you will end up just like them. Make sure you hang around other successful and positive people who lift you up, not bring you down. # 23 It’s okay to dream big, but you also have to be patient. Anything of value takes time. My Take: Good things take time. Flush the lottery mentality. Come up with a plan, put in the work and be patient. Just focus on what you should be doing and everything else will fall into place. # 24 The journey is everything. My Take: Who you will become in your journey to success is much more valuable than the money you will earn. I agree with Eric on this one. After spending 13+ years in the industry myself, I am most proud of the skills I have developed, my personal growth, and whom I have become. Who the Book will Benefit: I think the book will benefit any network marketer; however, I believe it is really designed for the new distributor with little experience in the industry. It would also benefit friends and family members of people who are involved with the industry. Why YOU Should Read It: You should read the book because it is filled with wisdom that took one man DECADES to learn. In a few hours you can l;earn what took someone else many years to learn. The book is easy to read, well organized, to the point, and offers plenty of practical tips you can apply IMMEDIATELY in your network marketing business. 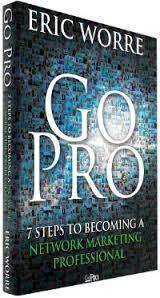 Final Analysis: I give “Go Pro: 7 Steps to Becoming a Network Marketing Professional” 9 of 10 stars. I am glad I purchased and read this book and am very happy to have it in my leader’s library. If you haven’t purchased it yet, you should. Order a copy on Amazon. Your Thoughts: If you’ve read “Go Pro: 7 Steps to Becoming a Network Marketing Professional” by Eric Worre, I would love to hear from you. Please leave a comment to this post to tell us what you liked about the book. What was the biggest or most important lesson you learned? I look forward to hearing from you. Previous Previous post: Who Makes the Most Money in MLM? Eric Worre is an awesome leader. In addition to his book – the Go Pro event in Vegas is something MLMers should check out. Russell Brunson’s Expert Secrets is another must-read for MLM! Yes, I am a big fan of Eric Worre myself. I have never been to one of his events, but I would like to some day. I’m also a fan of Russell Brunson. Of all the online marketers I’ve studied, Mike Dillard has been my best mentor. Of all the MARKETERS I have studied, Dan Kennedy has been my best mentor. Of all the network marketers I have studied, Mark Yarnell was my most important mentor. Achiever is a target. This is true in all facets of life. People get envious when you do better than they. People will attempt to sabotage. Be wary. Emotional attachment. Business and emotions do not mix. In business you need to be stable emotionally at all times. The journey is everything. I love this! Whether you win or lose it was the fact you were in the race and you tried. Be happy and enjoy life! It’s better to attempt something great and fail than attempt to do nothing and succeed. Eric Worre’s Go Pro sounds like a must-read. I’m fairly new to the concept of network marketing. I’ve mentioned in a few other posts that my first forays were a long time ago, before I knew what MLM was all about. With the help of your site and a few basic books, I’ve learned a lot. Would you recommend this book to someone still gathering a lot of information? The chapters look awesome. I just want to make sure it isn’t over my head. I think his “Go Pro” book is great for prospects and new people. All of his concepts are really easy to understand and his writing style is easy to follow. Go Pro by Eric Worre is an awesome book. It gives you specific scripts, tools, and techniques for the people you know, work with, and just met. Love his strategy! and also that he is not selling me anything, but helping me grow. I also watch all of his videos and have learned something new with each video. I’m glad you enjoyed the book as much as I did, Michele!